The Lyric Theatre Artist Residency Program, instituted in 2010, brings professional artists into our schools for an intensive, up-close and personal exchange with students. This unique experience allows dedicated artist mentors to kindle even the smallest spark of creativity in a child that might otherwise go unnoticed. The program debuted with “The Nestor Torres Initiative” - a weeklong residency with the Grammy award winning Latin Jazz artist Nestor Torres. Students and teachers from district elementary, middle and high schools participated in this initial endeavor; culminating in a public concert at the Lyric with a group of fortunate students sharing the stage with Nestor Torres. Extraordinarily talented performers including renowned Zydeco master Terrance Simien (“Creole for Kidz & the History of Zydeco”) and world-famous magicians The Spencers (teaching therapists at Martin Memorial Health Systems the “Healing of Magic”), have shared their passion allowing thousands of Treasure Coast students to benefit from their knowledge and generosity of spirit. The Lyric Artist Residency Program continues to flourish and inspire, playing a vital role in nurturing self-confidence, exploration and a love of the arts. 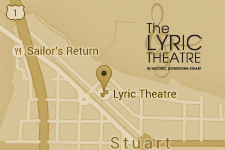 Master Class opportunities enhance The Lyric’s mission to support emerging and established area artists. Participants are able to interact with distinguished artists in a focused workshop setting and hone their craft through the feedback and invaluable experience of their mentors.